1. Magna Carta’s actual connection to the present day is unbelievably tenuous. The whole thing was repealed a couple of months after it was agreed, the Pope (who was technically in charge at the time) rubbished the enterprise completely (which is what reluctant signatory King John wanted him to do all along) and hardly any of the charter’s provisions survive in law. That it has any influence at all should be a surprise. That it’s the central text of representative democracy and the rule of law all over the place is mind-blowing. This is how pieces of paper (parchment) become totems, people. 2. The first one isn’t the important one. Later ‘editions’ of Magna Carta, copied out by monarchs, bishops, lawyers, barons – each introducing their own variations, glosses, limitations, expansions – have been more important in the formation of law and practice. Henry III’s 1225 version is probably the most influential and the nearest to a definitive Magna Carta. 3. Magna Carta didn’t make it into print for nearly 300 years. The first printed edition was published in London in 1508 (Caxton got going in 1473) and the first English translation wasn’t printed until 1534. That’s when its influence exploded. Hardly anyone knew it existed before that – the constitution nerds and rule-of-law geeks of their day. Once it could be passed around, though, in compact printed form, its language began to be used in laws, cited in disputes with overbearing monarchs, quoted in the popular prints. So – you guessed this already – the long-term influence of Magna Carta is actually all about advances in content distribution technology. 4. The Bill of Rights of 1689 is a much more important document. It’s an actual act of Parliament to begin with, using recognisable legal language, and most of its provisions actually survive in law. It’s the Bill of Rights that we have to thank for the modern idea of ‘civil rights’. 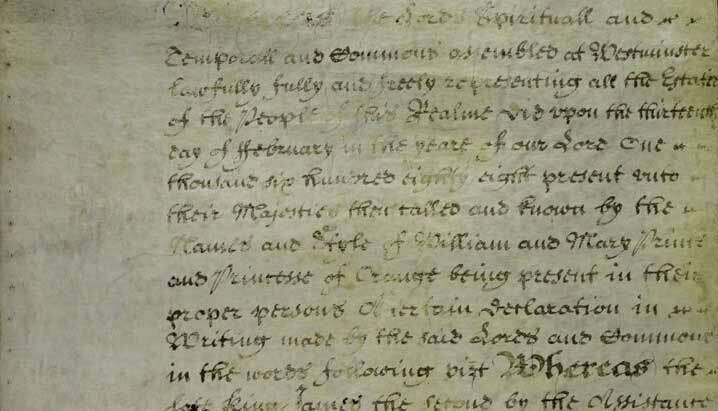 Many later documents owe a lot to the 1689 Bill of Rights – not least its American namesake (if you Google ‘Bill of Rights’ the English one doesn’t show up until page two) and the European Convention on Human Rights (PDF). I’m happy to learn that the resonant phrase “certain ancient rights and liberties” is from the Bill of Rights. It’s also, incidentally, unbelievably beautiful. Whoever wrote out the original document had the most exquisite roundhand. It makes Magna Carta look shabby. 5. The Cato Street conspiracy is one intense story. And it’s got the lot: a government spy, a honey trap, a ridiculous, hopelessly bodged plan straight out of a Tarantino movie and a brutal response from the state, including the last judicial beheading to take place in England. The conspirators set out not to assassinate a statesman; they set out to assassinate all of them – the whole cabinet anyway. Their beef was, er, vague, but hinged on the oppression triggered by the wave of European revolutions that preceded it. And Magna Carta was cited in the defence when the case came to trial. 6. The Chartists knew how to design a poster. As I said, I’m no historian but the orthodoxy is that the Chartists achieved almost nothing. They were after the vote for working men but it was decades before suffrage was extended meaningfully (and did you know that it was 1918 before all men over 21 could vote?). Fear of dissent and revolution meant the Chartists were harried out of existence before they could produce any change. But, while they were active, they were great communicators and the first movement to make really smart use of mass protest, of what we’d now call ‘the street’. This poster, which is in the National Archives, is absolutely beautiful. A vernacular letterpress masterpiece. We should all aspire to such clarity (there are others, like this one, for a meeting at Merthyr Tydvil in 1848 and this one, for a meeting in Birmingham in the same year. All lovely). 7. 1935 was the 720th anniversary of the signing of Magna Carta so, unaccountably, a year before that, a great pageant was held at Runnymede, site of the signing. The pictures and this Pathé newsreel suggest a very English blend of eccentric and noble, camp and dignified. I’d love to have been there. This BL blog post suggests something rather splendid and rousing: ‘It’s a Knockout’ meets a BBC Four history doc.